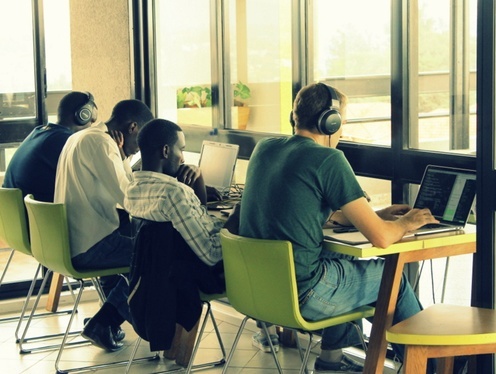 Innovation hubs are central to promoting technology-driven growth in Africa. They provide vital support, facilities and space to African tech specialists and entrepreneurs to develop innovative solutions to African problems. At Indigo, we support innovation and technology hubs across Africa from Kenya to Namibia, Cameroon to Zimbabwe. Rwanda is the latest addition to this growing list with a grant awarded to kLab, Rwanda’s first open IT innovation centre. The grant of £20 000 will be divided between topping up the general manager’s salary and providing seed funding for two new apps. With the general manager’s position secure, the already substantial achievements of the Hub can continue. kLab provides extensive mentoring and those working from the hub have already secured partnerships with Japanese and other foreign markets. These partnerships are impressive: Samsung is supporting kLabs in setting up a mobile apps testing centre and Carnegie Mellon University Rwanda are offering joint training programmes with kLab. With the oversight of the dedicated general manager at kLab, the long list of new jobs created and contracts being awarded to companies and individuals based out of kLab is set to grow and grow. Seed funding will go to MEPA, a diet advisory SMS app helping those with chronic diseases like HIV and diabetes, and i-Sarura, an agricultural information service. With £5 000 for each project, this funding will extend to all stages of development, from market research to bringing the apps to market. Under Vision 2020, Rwanda is pushing to establish a knowledge-driven economy in coming years. kLab is well-placed to play a key role in Kigali’s current technology boom. With i-Sarura already an award-winning project and MEPA having already secured a partnership with telecoms network MTN, we’re looking forward to seeing further successes coming out of kLab in the future. To find out more, visit http://klab.rw/.